We work to educate children across the country and protect them from all types of bullying, abuse and victimization with MBF’s evidence-based and evidence-informed prevention education programs. We see more children using the 5 Safety Rules to prevent them from becoming another statistic. We see more schools, churches, athletic and child-focused organizations adopt the MBF Child Safety Matters, Teen Safety Matters and Athlete Safety Matters programs. And when we see more adults become a “Safe Adult” for children – an important part of the MBF programs that encourage children to find a safe adult they can trust. And there is strength in numbers when an entire community comes together to support the organization and the people who in turn help support children. This is where you come in. On April 30, 2019 we invite you to make children in Northeast Florida and across America a priority. Help the Monique Burr Foundation for Children provide these programs to protect all children. On April 30th, MBF will host A Night at Roy’s at Roy’s Restaurant located at 2400 South 3rdStreet, Jacksonville Beach. Our annual Hawaiian-themed event featuring celebrity and world-renowned Chef Roy Yamaguchi is a remarkable evening for so many reasons. The energy at our event each year is electric, and attendance continues to grow. 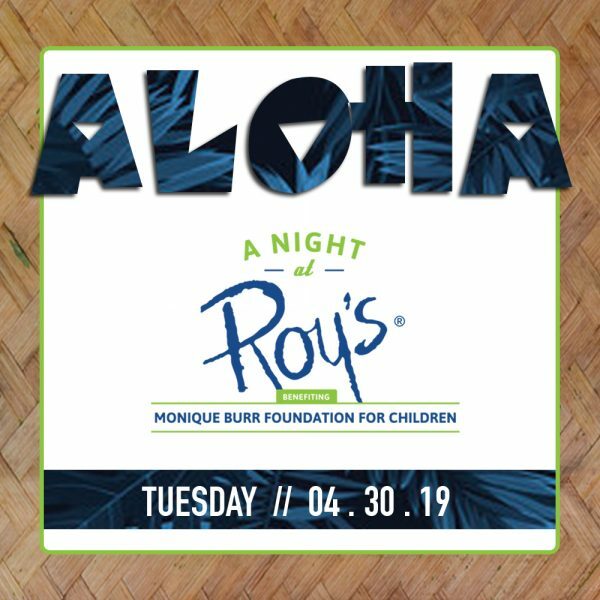 We invite you to be a part of A Night at Roy’s and meet Chef Roy Yamaguchi while you enjoy the tastes of his Hawaiian cuisine, tropical cocktails, fine wines, craft beer, live music, silent auction, wine raffle and so much more. But more than just a fun night, we invite you to be a part of helping MBF protect thousands of children! All proceeds from the event benefit Monique Burr Foundation for Children. Please join our efforts. Click here to purchase tickets for A Night at Roy’s.